The Merengue is a steady stepping dance that developed in the Caribbean during the 1800s. One story has it originating in the Dominican Republic, where it was danced by a crippled general whose guests respectfully followed his every move, including the dragging of the right leg. This "limp" step gradually became smoothed out, and the dance became quite lively. It is the national dance of both the Dominican Republic and Haiti today. The Haitian style is more subdued and slower; the Dominican style can be extremely fast and is designed for crowded dance floors and little progression. Round dancers use the slower, more sensual style. It is a very regular Latin rhythm with a "quick, quick, quick, quick;" look, rather than the more drawn out "quick, quick, slow, -;" of rumba. One dancer described the feel of merengue music as "Hep, hup, hep, hup." It is danced ball/flat or edge/flat with a rolling action and a subdued Rumba kind of a hip movement. Step with a flexed knee, take weight and straighten that knee as you release the now unsupporting knee. This shifts the hips to the supporting side: step/hip, step/hip . . . The hips move under a quiet upper body. There is a little knee action, too. If you allow the inside edge of the big toe to brush the floor, this will cause the unsupporting knee to veer in a little, to cross in front of the supporting knee. The knee action chases the hip action, and they can complement each other in a nice, rhythmic way. In closed postion facing line, step fwd, fwd, fwd, fwd; May be danced facing any direction and may be turned to left or right. You may also get the cue, "forward basic 6" or forward basic 8 or any even number. In closed position, step forward L (woman back R), close R, side L, close R; May be repeated as in "forward stairs 8." We begin in a facing position, maybe BFLY Wall, with lead feet free. 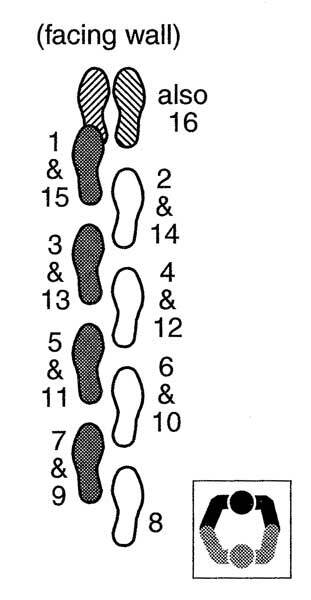 In the first measure, the man steps side, close, sd, touch; and the woman steps sd, cl, sd, cl; This transition puts you on the same footwork and prepares you to step in opposite directions. Now both will step sd, cl, sd, tch; but the man will be moving to his right (to reverse if he is facing wall), and the woman will be moving to his left (down line). We briefly touch hands in a left-hand star position. During measure 3, both step sd, cl, sd, cl; coming back to face. During measure 4, the man steps sd, cl, sd, cl; and the woman steps sd, cl, sd, tch; separating, man to line and woman to reverse and touching hands in a right-hand star. We have again transitioned and lead feet are free. May begin facing with the trail feet free, in which case we end in left-hand star, trail feet free. May begin in any facing direction. In Gravity Storm by Fisher, we start the dance facing and with R feet free for both. The side separation begins with the second measure of the standard figure. In the third measure, in R-hand star, both touch, and then the Fishers have a fourth measure that brings them back to facing, the man touches, and we end BFLY Wall, lead feet free, for a snake. In closed position facing the wall, step forward L (woman back R) with contra action and turn 1/8 LF. Step back R turning 1/8 LF. Step side L turning 1/8, and close R with no further turn. As with many merengue figures, may be repeated indefinitely. 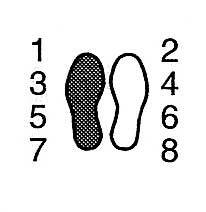 In semi-closed position, line of dance, swivel to face and step side L (woman side R), swivel to semi and step forward R, swivel to face and step side L, close R; The swiveling steps (1 & 2) may be repeated prior to taking the last two steps, so you could dance a promenade swivel 6 or 8 (or more). In closed position, line of dance, step side on lead and close. Step side again and leave trail foot extended, and recover. In closed position, wall, step side on inside edge of lead foot, then side on inside edge of trail foot, beginning to turn to semi-closed position. An option is to close on beat 2 instead of stepping side. On beat 3, step back into a fallaway position (semi). Step fwd again on trail foot and swivel back to closed position. With hands on partner's upper arms, back away from each other, bk, bk, bk (arms extended toward each other touching finger tips); then step fwd, fwd, fwd, fwd back to loose closed; May also be danced over four measures: move apart 8 steps and together 8 steps. In semi-closed position facing line, step side & forward L (woman side & forward R). On beat 2, step forward R and swivel to face . On beat 3, close L. On beat 4, swivel LF (woman RF) and step back on the trail foot on an "a" count and touch the lead heel forward with no additional weight change. You may also dance this figure more like the Promenade Swivels above: swivel and step side, swivel and step forward, swivel and close, and then dance the "a4" as described. This is a standard figure as described by URDC. In this figure, we begin in butterfly position and we pretty much march in place for three measures and 12 steps. As we do this, we turn under joined hands, one way and then the other, hands going up and down as we turn, until you end up back in the starting position. I think it is the arms going up and down and twisting as you turn that makes the figure look "snaky." Begin in butterfly position, man facing wall and woman facing center. In the first measure of music, step in place four steps. The man raises lead hands (his left and her right), steps left, right, left, right, and as he does so, he turns to the left 3/4 under those joined hands. He will turn first to line, to center, and finally to reverse. While the man does this, the woman steps right, left, right, left, and turns to the right only 1/4. At the end of the measure, lower lead hands. At this point, you are side-by-side, left hip to left hip in a sort of hammer-lock position with his left hand in front of her and at her right hip, and her left hand behind his back with his right arm bent behind his back. Again, she is facing line on the outside of the circle and he is facing reverse on the inside of the circle. One secret to making the arms work is to hold hands very lightly—really just touch fingers and let your hands turn against each other as you turn. In the second measure, again take four steps. Raise lead hands back up again, and both of you turn 1/4 to the right in two steps. She turns under those lead hands. Lower your arms and you will be standing back-to-back, he facing center, she facing wall. Now raise the trail hands (man's right and woman's left), and as you step twice, both turn 1/4 to the right. She turns under trail hands. Lower the hands and you are side-by-side again but right hip to right hip. Now the lead hands are at the man's back and the trail hands are in front of her and at the woman's left hip, man facing LOD and woman RLOD. In the third measure, raise the trail hands again. She begins to turn 1/4 to the right. He can briefly look at her through a window formed by the curve of his right arm. The man puts his head through that window and turns 3/4 to the left, turning under his own right arm, again in four steps, and you end in butterfly wall as you began. During measure one, both turn under lead hands, during two she turns under lead hands and then under trail hands, and during three he turns under trail hands. Again (see Snake above) we begin in butterfly position facing wall. Here, we begin with the trail hands. Raise them and turn 1/4 to the right in four steps: L, R, L, R. She turns 3/4 to the left under those raised arms: R, L, R, L. Lower your arms in front of you, and you are side-by-side, left hip to left hip. Trail hands are in front of the man and lead hands are behind the woman in a hammerlock. He is facing reverse. She is facing line. In the second measure, he raises his right hand, turns 1/4 right face under it in two steps (she turns 1/4 to right), and lowers hands, quickly raises left hand and turns 1/4 to right under those hands in two steps (she turns 1/4 more), and lowers hands. Note he has turned under trail hands and then under lead hands. She turns under no hands. Both have turned 1/2 to right. End side-by-side, right hip to right hip, lead hands in front of man, and trail hands behind woman in hammer-lock. In the third measure, raise lead hands and turn woman 3/4 to left under lead hands in four steps. Man turns 1/4 to right. You can end in open facing position, or you can take lead hands again and end in butterfly.